ASUS in its campaign to make the EeePC more affordable to the buying public had offered a price reduction in its EeePC 10" 1005P. 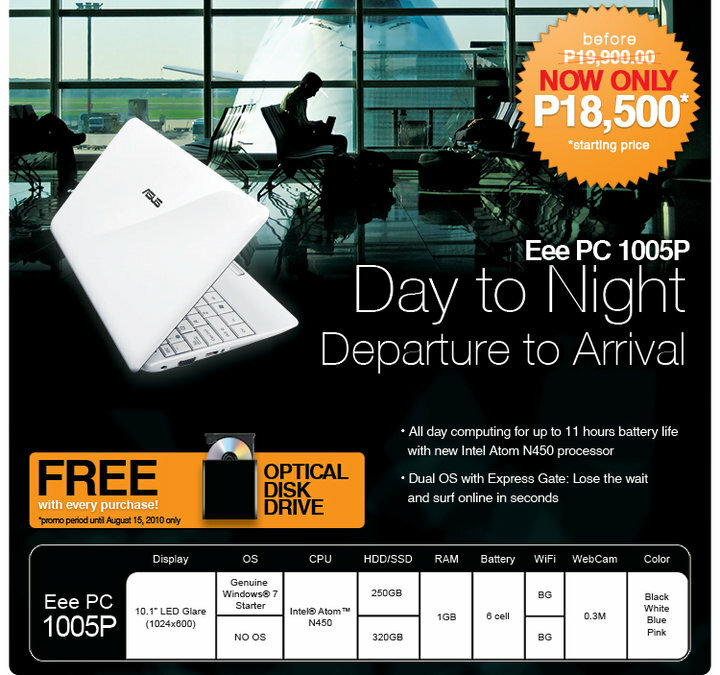 The EeePC 1005P which is priced at P19,900 can now be purchased for a starting price of P18,500. 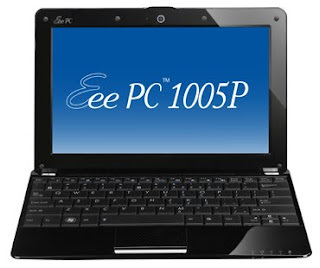 This new low price of this 10-inch EeePC is only until August 15, 2010 only and also comes with a FREE Optical Disk Drive (ODD). The main power of the ASUS 1005P EeePC is its long battery life. In fact the products main tagline is, "Dat to Night. Departure to Arrival". IT's battery can last up to 11 hours and it is powered by the Intel Atom N450 processor. The secret of the long battery life of the 1005P EeePC is the exclusive ASUS Super Hybrid Engine. This engine increases the power efficiency of the Eee PC. Through this the unit can deliver an impressively long battery lifespan—eliminating worries about power while on-the-go and easily keeps users connected for full day. 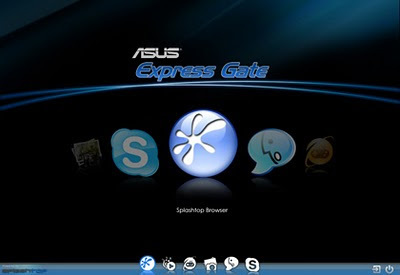 It also includes an innovation of ASUS, the OS Express Gate which allows you to suft, chat and connect to the internet in seconds without the need to log-in to your regular OS or to Windows. The starting price of P18,500 will actually depend on the package and end configuration of the ASUS 1005P EeePC that you will choose. You can choose to include a genuine Windows 7 OS with your purchase or take it home with just the Express Gate OS installed. The selection for Hard Disk Drive for this model can be either a 250Gb or 320Gb hard disk. Also, you can choose from four different colors: black, white, blue or pink. Here more features for you. If you will choose to get it with Windows 7 installed you will be unlocking Windows 7 only features of this unit. The ASUS EeePC 1005P comes with the ASUS Eee Docking. Eee docking is an intuitive software suite that offers easy access to digital content, services, and useful software. ASUS EeePC also comes with the Multi-touch pad feature. With the Multi-Touch gesture input feature, you can easily zoom in and out to view photos or read documents by just moving two fingertips apart or together on the touchpad. You can also simultaneously slide two fingertips up or down the touchpad—making scrolling in a window easy without the use of a mouse. Lastly it comes with Bluetooth V2.1 which will allow you to easily transfer data between Bluetooth-enabled devices' and brings forth excellent connectivity. With all that features I think that this product is really worth your consideration. It might not be the best for gaming yet it can be a mobile unit that will not fail you when you need it badly. I suppose that those who want to avail of this great gadget needs to decide and visit their nearest ASUS Store of ASUS dealer. For more information on the latest ASUS products, you can visit their Facebook page.